Four years ago, the Indian Super League introduced itself to the nation with much pomp and show. When Bollywood star Priyanka Chopra struck her final pose at the end of her opening ceremony performance, the flash lights from thousands of cameras and phones across the Salt Lake stadium was only outshone by the fireworks in the background. As the spectacle was met with raucous applause, the camera panned to the various celebrity owners of the eight franchises and for better or for worse, Indian football would never be the same again. The inaugural season delivered on its promise of pageantry and grandeur as high-profile businessmen and wealthy corporations pumped money into their respective clubs while actors and cricketers alike capitalised on the investment opportunity. However, nothing contributed to the glitz and glamour the league was instantly synonymous with than the inclusion of several marquee players, with each franchise obligated to make at least one eye-catching signing. The idea was to instantly draw audiences and this was a sure shot strategy. The first season attracted one million in stadium attendances. The league stood fourth across the world in terms of average attendance, trailing only the Premier League, La Liga and Bundesliga. Why did it work so well? At the turn of the century, a new generation of Indian sports fans were captivated by the Premier League as its frenetic pace and fierce competition graced screens across the country. As European football became more popular in the region, so did their biggest stars while the local leagues were largely overlooked. It’s no wonder then that the first ISL season featured a list of marquee names that read like a who’s who of football royalty from the early to mid-2000s. From ‘Invincibles’ like Freddie Ljungberg and Robert Pires to revered Serie A legends Alessandro Del Piero, Marco Materazzi and David Trezeguet, the ISL meant business. Meanwhile, the active involvement of Bollywood actors captured the attention of even the football illiterate. Acknowledgements of Abhishek Bachchan’s team triumphing over Hrithik Roshan’s would occasionally seep into conversations at the local supermarket otherwise dominated by the escalating costs of onions that month. However, despite the overwhelming success of the first two seasons, a structure reliant on expensive signings was never going to be sustainable. In the last two campaigns, several clubs have opted against recruiting marquee players with only two franchises doing so in the 2017/18 season. It would seem the big-money assets are now being phased out, but how does that affect the league? Amoy Ghoshal, chief technical officer of current champions Chennaiyin FC, is unconcerned by the growing trend. 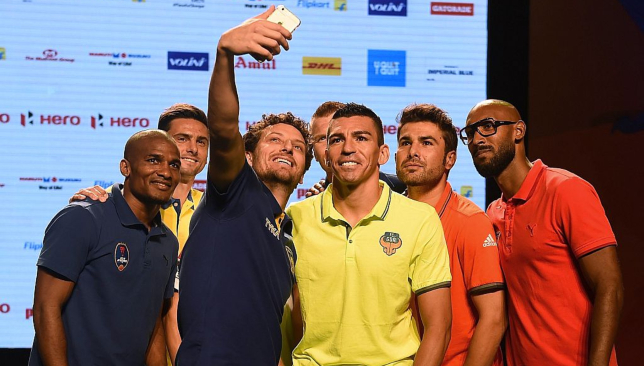 Star studded: ISL stars in season two. Players of lower profiles have stepped up. The lesser-known former La Liga striker Coro was the top scorer with 18 goals last season. Bengaluru FC’s Miku, Kalu Uche of Delhi Dynamos and Jamshedpur’s Tiri were also impressive performers. The absence of marquee names also offers Indian players the opportunity to take centre stage. As the country’s football icon, Sunil Chhetri is never too far from the limelight. The national team’s captain and all-time top scorer was the highest-paid Indian player last season, raking in Dhs 775,972. Chhetri is confident that the absence of marquee players will only benefit Indian footballers both on and off the pitch. The lack of marquee players has coincided with a drastic drop in attendances though. Compared to the league’s average attendance of 27,111 in 2015, the 2017/18 campaign could only muster 15,047, conceding a 44.44 per cent decrease. Delhi Dynamos FC’s media manager, Shikharr Chandra, is candid in his acknowledgement of the challenges that the franchise has faced without the luxury of a marquee name. “The club has seen the likes of Del Piero and Roberto Carlos so there’s always an expectation from the fans that we might bring a new big face every year,” he admitted. “It is difficult because we keep getting this query on our social media posts, with fans asking to bring in marquee names. However, the drop in interest and attendance can’t simply be put down to the lack of marquee players. Kerala Blasters FC boasts a passionate fanbase that in the past has been starved of national league football having never had a representative in the I-League. The Manjappada Kerala Blasters Fans group has over 280,000 likes on Facebook and was named Fan Club of the Year at the Indian Sports Honours event in 2017. The ardent supporters were treated to a marquee name in Dimitar Berbatov last season while former Manchester United team-mate Wes Brown was also among their ranks. The club boasted a healthy average attendance of 31,763 last term but it was still a 42.8 per cent drop from the previous campaign’s average of 55,535. 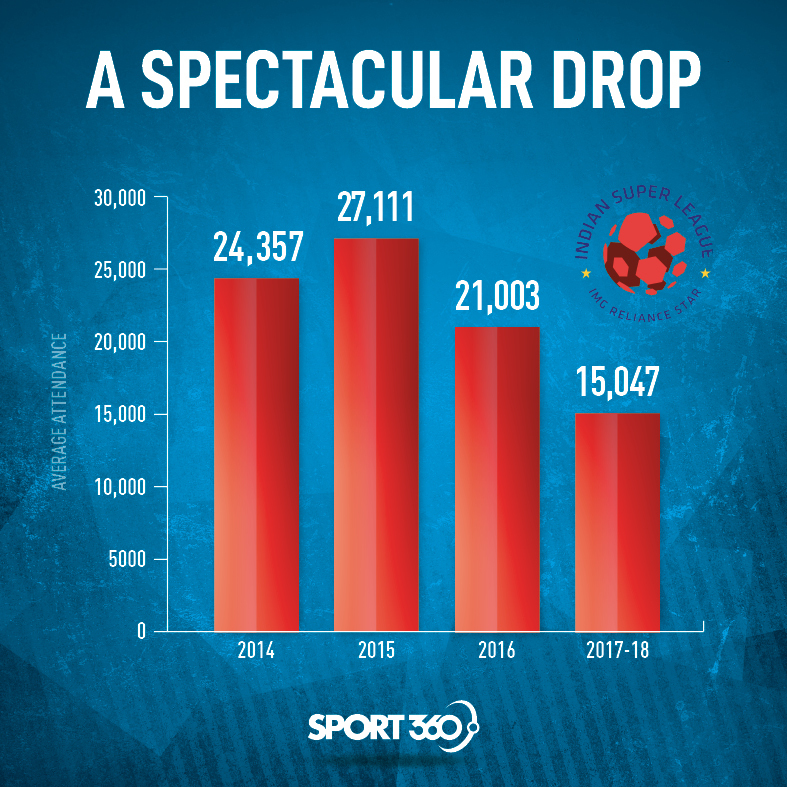 The significant drop in match-going crowds in Kerala has contributed to a large chunk of the decrease across the league. However, while the numbers are alarming, they must be taken with a pinch of salt. The Jawaharlal Nehru Stadium in Kochi used to boast a capacity of over 60,000 but changes to the stands ahead of the U-17 World Cup last year has now seen it limited to 39,000. “Team performances also played a major role,” Somu Joseph, a Manjappada Kerala Blasters Fans group administrator, reasoned as the team slumped to an eighth-place finish last year after being runners-up the season before. Somu believes fans will be just as supportive in the absence of high-profile names though. Meanwhile, in the last two years, Mumbai City FC also moved from the DY Patil Stadium where they enjoyed an average attendance of 28,000 during the inaugural season to the Mumbai Football Arena that holds only 7,960. To add to the change of venues, shifting time slots last season also impacted falling attendances. Moving kick-offs from 7pm to 8pm – on request of the league’s broadcasting partner, Star – has not been easy on fans as it means they return home late which is difficult, especially on weeknights. The league is reportedly set to revert to 7pm kick-offs for the new season. The evidence suggests that there is a drop in interest in the ISL but the numbers don’t tell the whole story and are not worth panicking over just yet. In fact, there is reason to even be optimistic. If the ISL is the catalyst for change in Indian football, the concept of marquee players was a key element in that chemical reaction. But the novelty has worn off and teams must now produce football of substance and indicative of progress in order to survive. Clubs have started to invest a lot more in their infrastructure, particularly focusing on youth development. The I-League, previously India’s undisputed top tier, has been opposed to the ISL since its inception but the two divisions now run parallel to each other under special dispensation from FIFA and the AFC. A proper league structure is certainly in favour of the greater good though and the leagues will eventually have to merge. All the signs suggest that the ISL is here to stay. Marquee players, having served their purpose, are not. Ryan Giggs is preparing for Wales to enter the unknown against a Denmark side consisting of lower-league and futsal players. Denmark’s preparations for their UEFA Nations League opener against Wales in Aarhus on Sunday are in chaos following a dispute between the Danish football Association and their Players’ Association. The Danes are set to field an uncapped scratch side consisting of third-tier and futsal players, the latter being an indoor five-a-side game played with a harder and smaller ball. 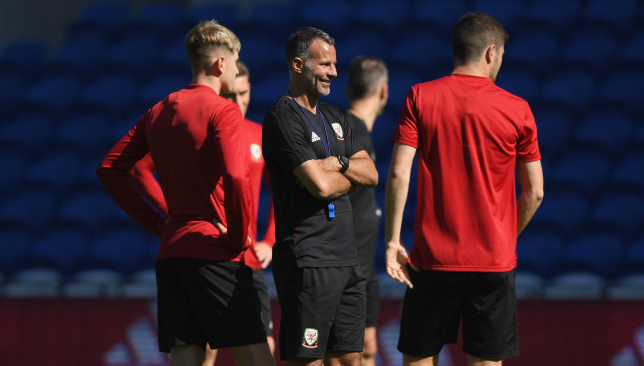 “What sort of team we’re going to face I don’t know,” Wales manager Giggs said ahead of his pre-match press conference for their inaugural Nations League tie against the Republic of Ireland in Cardiff on Thursday. “There’s a bit of me that thinks they’ll sort it out, but every day that looks more and more unlikely. Denmark are ranked ninth in the world and reached the last 16 of the World Cup in Russia this summer. But players like Tottenham midfielder Christian Eriksen and Leicester goalkeeper Kasper Schmeichel are set to sit out the Wales game because of a row over the players’ commercial rights. Instead, Denmark have named a squad of part-time players drawn from Danish clubs such as Avarta, Kastrup, Skovshoved and Vanlose. “It’s very unusual and it’s obviously not ideal,” Giggs said. “As a footballer you just want to play football but if you feel you’re not getting a good deal you want to get it. You think it would have been sorted by now, but it’s not. “The problem the Danish Federation have got is that they’ve got to put out some sort of team because they could be banned for four years if they don’t. 🗣"It's an exciting format and it's good for the fans." 🏴󠁧󠁢󠁷󠁬󠁳󠁿 @GarethBale11 calls on #TheRedWall to give the squad the extra energy they need on the pitch as Wales take on the Republic of Ireland. The Denmark turmoil has overshadowed Giggs’ first home game as Wales manager and a reunion between two teams who met in a do-or-die World Cup qualifier last October. The Republic ended Wales’ qualification hopes by winning that Cardiff clash 1-0 before losing to Denmark in a play-off the following month. “It’s a proud moment for me and I’m very excited,” said Giggs, who has overseen friendlies in China and the United States since his appointment in January. “But we know it’s going to be a tough game. The Republic have not been beaten in their last six competitive away games and we know what we’re up against. “We know it’s a team that is going to work hard and make it difficult for us. Giggs has reported a full-strength Wales squad with Gareth Bale fit and firing after scoring in Real Madrid’s opening three La Liga games. Jose Mourinho has agreed to pay a fine to settle a tax dispute with the Spanish authorities during his spell at Real Madrid, it is understood. Contrary to reports in Spain, which emerged on Tuesday, the deal did not involve the now Manchester United manager accepting a one-year suspended prison sentence. 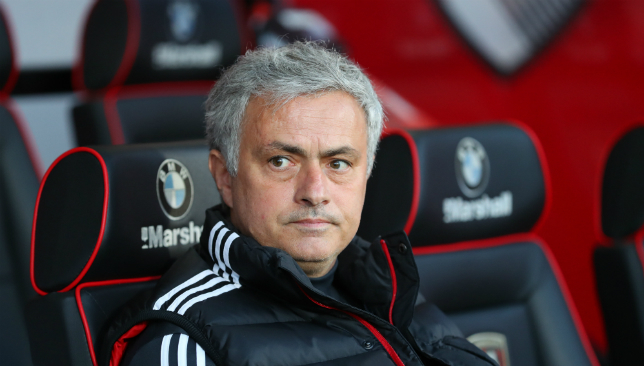 A case had been opened against the Portuguese coach last year, which alleged former Real boss Mourinho owes the Spanish state nearly £2.9million in undeclared revenue related to image rights in 2011 and 2012 – a claim which has been strenuously denied by his representatives. On November 3, 2017, Mourinho made a brief appearance before a judge at a court in Madrid, and said as he left courthouse he had paid everything he owed to Spanish tax authorities. On Tuesday, Madrid-based media outlet El Mundo reported that a deal had now been reached which will see the case closed, with the 55-year-old accepting a fine of around £1.8million as well as two six-month suspended sentences, one for each tax fraud case. Under Spanish law, a judge can suspend sentences which are two years or less for first-time offenders. 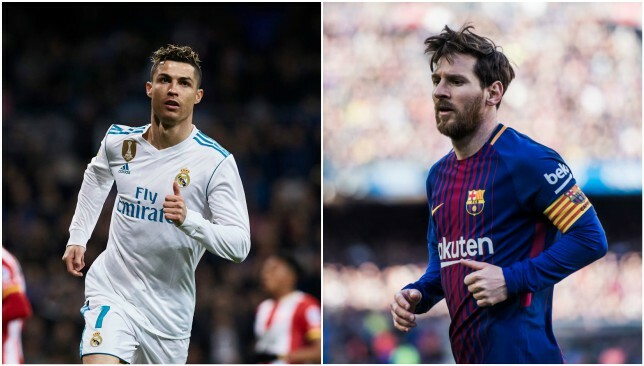 Cristiano Ronaldo and Lionel Messi are two of the stars caught up in fraud cases in Spain. Press Association Sport understands from a source with knowledge of the case any form of suspended prison sentence has not been handed out or accepted as part of the agreement, which had been reached more than two months ago. A fine will be paid. There was no comment from Manchester United on what is regarded a private matter. Mourinho’s representatives Gestifute Media were also approached for comment. The allegations against Mourinho are part of a wider crackdown by the Spain authorities against tax fraud, with several leading figures in football having been investigated – including Barcelona midfielder Lionel Messi and former Real Madrid forward Cristiano Ronaldo. Mourinho guided Real Madrid to the 2011/12 La Liga title, returning to manage Chelsea after leaving the Bernabeu in June 2013 before taking over at Old Trafford in May 2016. Commenting on the allegations against the United boss in June, Gestifute Media said at the time: “Jose Mourinho, who lived in Spain from June 2010 until May 2013, paid more than 26 million euros in taxes, with an average tax rate over 41 per cent, and accepted the regularisation proposals made by the Spanish tax authorities in 2015 regarding the years of 2011 and 2012 and entered into a settlement agreement regarding 2013.